Published on 17 January 2008. 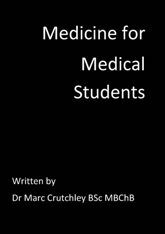 About a month ago, Dr Marc Crutchley sent me a copy of his new book, Medicine for Medical Students, and asked me if I’d review it on here. Clearly, that’s not something I’d normally do – I don’t think I’ve reviewed any sort of medical textbook of any description on this site ever… but I’m raving about this one. I’m struggling a bit to come up with a way of describing the book without it sounding crap. Essentially, it’s written by a recently qualified doctor, and aims to be everything you need to know as a medical student condensed into 118 pages, so that readers no longer have to spend a fortune on 600 different textbooks. And it works really, really well. I’ve seen books like this before, and never really liked them – I’m sure most other medical students have too – but this one is just great. It’s brilliant not only for revision, but also for those mornings when you wake up, realise you’re on some other speciality that day and can’t remember a thing about it – flick to the relevant section, and you can get a thorough but quick reminder of most things you’re likely to see and do before you’ve finished your cornflakes. The content does require a fair amount of prior knowledge, and wouldn’t be great for someone learning things for the first time, but as a revision aid it is just fabulous – primarily because it assumes a basic level of knowledge, and also doesn’t go into complex depth – it’s pitched at exactly the right level. I’m currently so enthusiastic about this book and its ideology that I think I might still be raving about it in a decade’s time, much like I still rave about QBasic by Example despite the fact that QBasic is now a relatively archaic programming language and that I haven’t written a program in it for almost a decade. My writing is getting more rambling by the day, isn’t it? Dr Crutchley also has a lecture series available for sale, and is in the process of making a clinical skills DVD. You can get the book and the lectures from his website – TheMedicalStudent.com – both come very highly recommended. As there’s no way on Earth that I’m going to give away my review copy of this book, a donation has been made to charity to keep this post in line with my ethical review policy. This 1,256th post was filed under: Reviews. Comment posted at 10:50 on 22nd October 2008. Is this book available in the Internet? Comment posted at 18:18 on 17th February 2009. Would love to see some excerpts from this book that reflect the style of writing that you would expect to find in it. Sounds like a good book but examples help give me q quick snapshot of what everyone should expect. Comment posted at 08:39 on 5th October 2010. The web address is not working. Does anybody know how to purchase the book elsewhere? Comment posted at 22:22 on 5th January 2013.